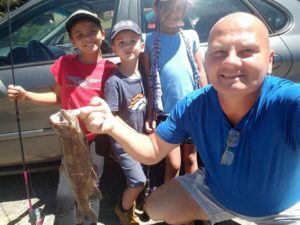 Steve Guthrie looks forward to fishing with his kids since recovering from his most recent spine surgery. 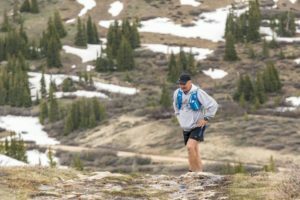 Steve Guthrie’s chronic neck pain began back in 2000 when a large gust of wind suddenly got hold of the camper trailer he was hauling over Vail Pass. Though he tried to regain control, Guthrie’s camper and truck swerved sideways, crossing over the highway and then rolling down an embankment. Guthrie sustained a broken rib and neck injuries and was taken to an emergency room for treatment. Six weeks later, Guthrie visited George Leimbach, MD, a physiatrist at the Center for Spine and Orthopedics who specializes in physical medicine and rehabilitation for chronic pain. Dr. Leimbach performed nerve root blocks, acupuncture and trigger point injections to alleviate Guthrie’s neck pain and referred him to a chiropractor and medical massage specialist for additional care. During the next two years, Guthrie saw Dr. Leimbach and the other specialists until the day that Guthrie heard his neck and back pop while stretching. At that point, his neck pain greatly diminished, and he only saw Dr. Leimbach for occasional trigger point injections until 2010 when his pain returned while he was shoveling snow. 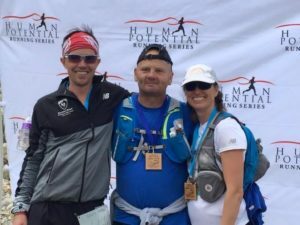 Guthrie also plans to try running another ultra marathon since his surgery by Dr. Anton Zaryanov at the Center for Spine and Orthopedics. Guthrie returned to active duty with the U.S. Navy that November after getting back into shape with a running program so he could pass the Navy fitness test. Then, after coming off active duty in 2014, Guthrie’s back began hurting. An MRI revealed degeneration in his L4-5 and SI spinal discs. Once again, he returned to Dr. Leimbach for injections for pain relief. Non-operative treatment sustained him for the next two years. In 2016, while working as a security guard in downtown Denver, Guthrie tripped while running up a flight of stairs during a pursuit. “I grabbed a handrail to keep from crashing and tore my rotator cuff,” he explains. After physical therapy failed to relieve the pain, Gruthrie opted for surgery and visited another of Dr. Leimbach’s colleages at the Center of Spine and Orthopedics, Dr. Lucas Schnell. Dr. Schnell, an orthopedic shoulder specialist, repaired the tear that December. Outdoorsman Steve Guthrie was first treated for chronic neck pain by Dr. George Leimbach after rolling his truck in 2000. Over the last 17 years, he’s returned for total disc replacement surgery by Dr. Michaal Janssen, shoulder surgery by Dr. Luke Schnell and spine fusion by Dr. Anton Zaryanov and is back to running again. During his shoulder rehabilitation, Guthrie’s back problems took a back seat. However, the pain grew worse to the point that he could no longer sit for more than five minutes or lie down comfortably. Thus, in March 2017, Guthrie underwent spinal fusion of his L-4 and L-5 discs by Dr. Anton Zaryanov, another spine surgeon at the Center for Spine and Orthopedics. Although Dr. Zaryanov warned Guthrie that fusion surgery could end his running days, the 50-year old walked a mile in the hospital the same day of his procedure and began running again five weeks later. “I’ve had no pain nor felt restricted since the surgery. I can lie down, drive and have had no issues with my back, even when I’m running,” he says.